I just watched this short film (4’56”) with scientists describing different types of magnetic interactions (e.g. on the sun, on Mars, in a regular situation). The filmmaker CGI-ed in visualizations of the various types of magnetic fields that come up. The still above is from the short. My first reaction: hmmmm, applying this in the classroom somehow? naaaaah. This picture represents part of the JPL and the strength of the magnetic fields within it. Clearly you see why the movie brought back this image to me. I love that an argument had to be made for laboratory teaching (not everyone agreed), and then there were battles over what kind of teaching should happen in the laboratory itself. Sometimes looking back on this project makes me think: wow, that’s such an interesting dissertation you abandoned. Picture taken from R.W. 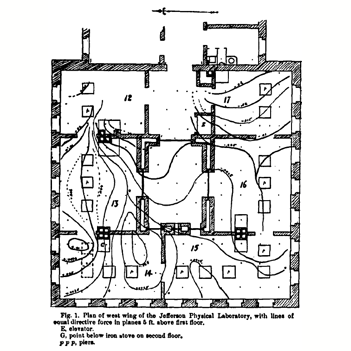 Willson, “The magnetic field in the Jefferson Physical Laboratory,” The American journal of science 39 (February 1890): 87-93. On 174 in “The laboratory in modern science,” Science 3 (15 February 1884): 172-174.